Why think small when you can think big! 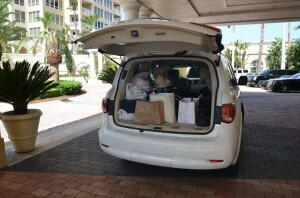 This is the case with Infiniti’s QX56 full size SUV. Recently, my family and I wanted to go on a short vacation to the west coast of Florida. Knowing them, they wanted plenty of living space as well as cargo room for inevitable purchases during the drive and as it turned out, the QX56 could not be a better choice for this journey. The QX56 has an unmistakable look, with bold, elegant design lines. The optional 22 inch aluminum-alloy wheels are gorgeous, so are the jewel-like HID headlights as well as its front fascia. Doors are easy to open and offer roomy access. 3rd row seating is reached by flipping the electric foldable 2nd row captain chairs. Tail gate operation is electric with push-button opening and closing. We departed Key Biscayne Florida with four people and luggage on board. 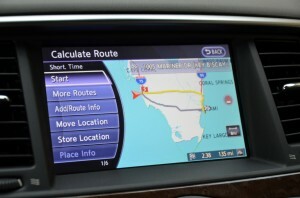 I entered the destination into GPS navigation and off to Sarasota we went. One thing that was clearly apparent after 20-30 minutes of driving was how effective the A/C system is on the QX56, not only for the front seat occupants but also for the 2nd and third rows. With the hot Florida summer, many A/C systems are hard pressed to cope, offering marginal cooling at best. In the QX56 we actually turned down the fan speed to almost minimum. This brought memories of me as a kid in the back row of the family station wagon dripping with sweat as the A/C never did reach back there. 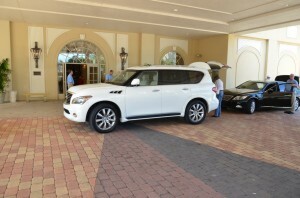 After a comfortable and leisurely journey across the Florida peninsula, we arrived at The Ritz-Carlton in Sarasota, where the porte-cochere attendant greeted us warmly and enthusiastically. Interesting to note, he instantly commented, “nice ride”. This is a true compliment, especially from someone that has seen and driven almost every luxury vehicle.We stopped for lunch at a surprisingly good Chicago sandwich restaurant in Naples. As it turned out, it was previously, a service station. After a great lunch and short break, we set off to our destination, Sarasota. The Infiniti QX56 is powerful and sure footed on the highway, with plenty of grunt for passing or simply for accelerating out of a situation. Highway cruising is effortless, made even more so, with the intelligent cruise control. Ride is smooth and quiet, an extraordinary feat, considering its twenty-two inch wheels and sporty, low profile tires. While in Sarasota, we explored the good eateries and sights, one being the spectacular John and Mable Ringling Museum. No, it’s not a circus museum, well it is, but only a little bit…It is primarily an art museum featuring Mr. Ringling’s eclectic collection of world class art as well as his palatial waterfront home, Ca d’Zan. As far as the circus exhibits go, the most interesting is the diorama of the circus life that took 40 years to complete. That evening, we drove up to Tampa by way of the scenic and spectacular Sunshine Skyway Bridge, which crosses over Tampa Bay. We dined at the sumptuous Bern’s Steak House. It’s a gourmet restaurant with a well-earned reputation of being one of the world’s greatest steak houses. Yes, it really is! After dinner, we were treated to a behind the scenes kitchen and wine cellar tour. With its 500,000 bottles of wine, the Bern’s cellar is considered to be one of the largest wine collections in the world. 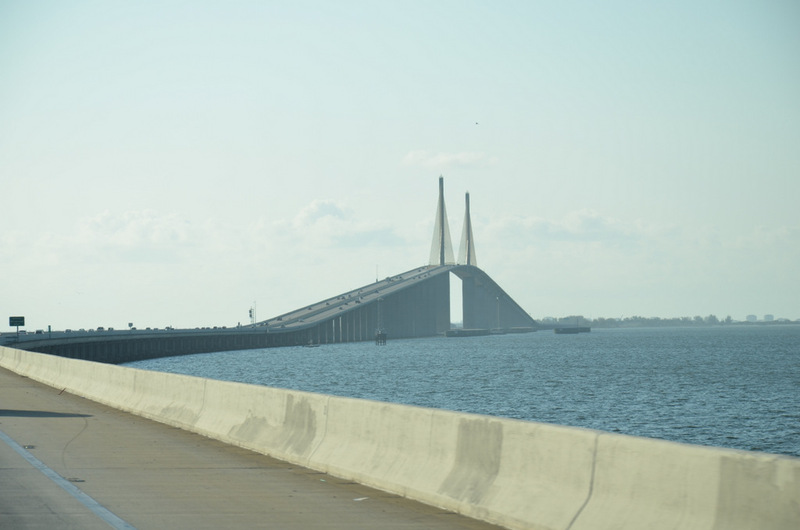 The drive back to Sarasota was pleasant; made even more so, with the sounds from the superb sound system. 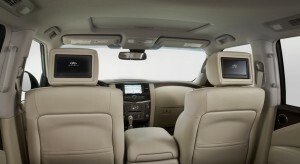 The interior of the QX56 leaves nothing out yet never feels cluttered or overdone. Fit and finish is excellent. There is a distinct improvement of quality to the previous generations’ switchgear. 2nd row seats have individual video monitors with wireless headsets. Infotainment system is intuitive, even for the biggest audiophile. Cargo area is equally luxurious, with cavernous room when the third row seating is stowed. Throttle response and acceleration is smooth and linear. Be mindful though, hard acceleration in the QX56 will quickly dip the average fuel economy into the single digits. Ah, yes, fuel economy; our drive netted us 15 MPG combined. Brakes feel powerful and compliant, no small feat, considering the hefty weight of the QX56. We found the throttle, brakes and transmission work so well together, that we easily could do limo stops with little effort. A limo stop is when the driver is able to come to a full stop without feeling the vehicle actually stopping. A good limo driver can do this regularly. Considering a full sized, luxury SUV? 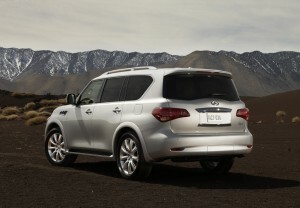 Then the 2012 Infiniti QX56 is the one to buy, offering the perfect blend of style, performance and panache.